PowerPoint visuals to teach six lessons for Jesus: God Who Cares for People. PowerPoint visuals to teach six lessons for the Jesus: God of Power and Glory series. Includes additional GNC resources: Word-Up visuals, resource booklet, Books of the Bible poster, map, time line, time line pictures, map pictures, missionary story Angie Goes West (new visuals for Angie Garber story) coloring sheet, UPS rules. 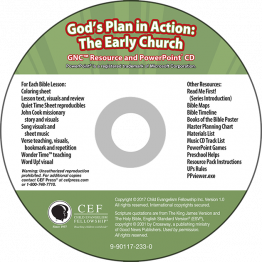 Includes additional GNC resources: Word-Up visuals, master planning chart, resource, preschool plan, booklet, Books of the Bible poster, map, time line, time line pictures, map pictures, reproducible coloring sheets and Quiet Time sheets, UPS rules, mission story of Martin and Gracia Burnham. PowerPoint visuals to teach six lessons on the early church. Includes lesson visuals, texts and GNC resourses: verse visuals, teaching cards, resource booklet, time-line, time-line pictures, books of the Bible poster, mission story on John and Lois Cook.